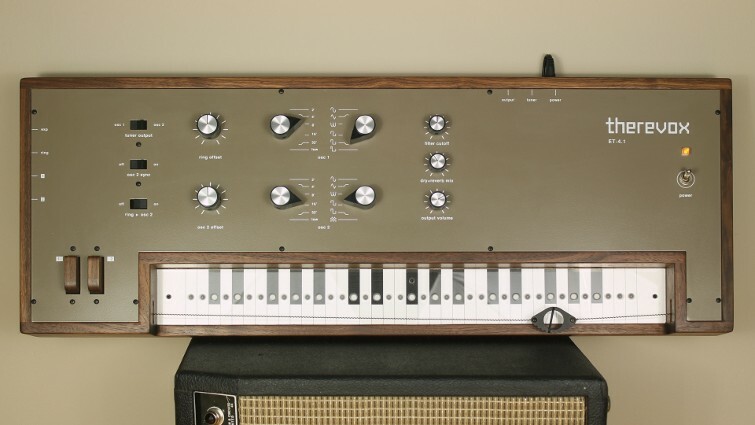 The ET-4.1 takes the unique au ruban interface of the rare Ondes Martenot and combines it with analog synthesizer circuitry. Each oscillator has six different waveforms, including the classic sine wave of the Electro-Theremin and the Ondes Martenot's unique octiviant and white noise settings. Each oscillator can be tuned separately, or synched to create intervals or interesting harmonics. Oscillator 2 can also be set to a consistent note or used as an LFO to modulate the filter. The internal low-pass filter with variable cutoff frequency is used to shape the sound and this can also be controlled with an external expression pedal or CV source. A classic spring reverb unit is also built into the ET-4 with mix control ranging from 100% dry to 100% wet. A wide range of sounds can be created with the ET-4; from haunting ethereal sounds and deep bass grooves to sci-fi soundscapes and classical voicings. Every ET-4 is individually hand crafted in Canada using high quality components and select North American Walnut. Dimensions: 30 x 11 x 4"
Includes: Printed manual, power supply (110-120V and 220-240V Available) and extension cable. For more videos, see the ET-4 Series playlist on our YouTube channel. A deposit of $400 starts the build of your ET-4.1. Build time is currently 3-4 Months. We ship wordwide. The cost of shipping is approximately $50-80 within North America and $120-180 to Europe. Accessories available include our custom Tweed Road Case and matching Expression Pedal & Cord.